There are so many smart plugs on the market; different features, different ratings, and different home automation systems, which one to buy can be a serious challenge. Fear not, we've got your back! Today we're breaking down the best smart plugs and what you should watch out for when deciding which one is right for you. And if you are still on the fence about which lighting & power smart device is best for your requirements, you might want to check out our smart plugs vs smart switches before diving in! BEST OF THE REST - MINI SMART PLUGS & MORE! So exactly what is a Smart Plug? Smart plugs are powerful and versatile devices, allowing you to intelligently and remotely control any device you plug into them. With smart plugs, you can remotely access and control kitchen appliances, making sure things are off when you aren't home, or turning them on when you need them. When used with other home automation systems like Alexa or Google Home, they are even more powerful and convenient. When integrated with Amazon Alexa, Google Home, HomeKit, or other home automation system, smart plugs become even more powerful and versatile. Before you buy and setup a smart plug, it's helpful to think of some of your most frequently encountered problems that you might use a smart plug for. These are some common reasons that people initially adopt smart plugs, and it's a good guideline for where you should start. Do you not want to get out of bed at night to turn off the lights? Do you find yourself at work wondering if you remembered to turn off the clothes iron or hair curler? Do you find yourself at work remembering that you forgot to turn on your slow cooker as you had intended? Do you want to remotely activate your coffee maker in the morning before you get out of bed? Do you want to be able to restrict TV or gaming console in a child's room? Do you want house lights or outdoor holiday displays to come on automatically at sunset? 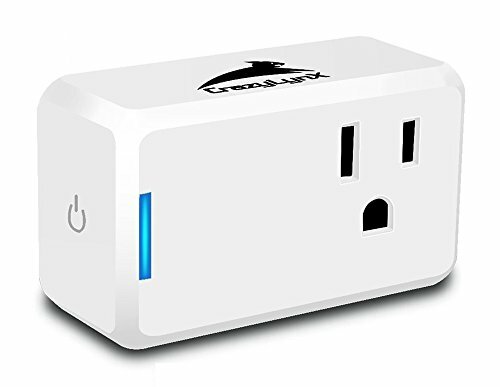 Smart Plugs require a grounded outlet, and many are only rated for a max of 10 AMPs. Make sure that your outlets and your appliances are compatible with how you want to use a smart plug. Note that many smart plugs are large enough to block access to nearby outlets. If you anticipate crowding, choose a small smart plug, or consider using a smart plug with an extension cord or power strip instead. Do you have a voice assistant or existing home automation controller, and will your plugs work with that ecosystem? If you don't, you may still want to future-proof your investment by making sure it's compatible with home management and digital assistant systems you might adopt in the future. When connecting with Alexa, also check user reviews of the Alexa skill on Amazon. If you alter your Wi-Fi settings after you install the devices, you will need to re-add them. This is important because it's possible that your smart home ecosystem will grow over time. If you start with 2 smart plugs, you may want to add more. And perhaps you want to add smart bulbs, home security, or other connected devices. Setting up your network correctly ahead of time will prevent you from having to reconfigure all your devices as you increase automation over time. The more features of your home you automate, the more of a security risk it becomes, so be mindful of choosing strong passwords and changing them often, not using public Wi-Fi networks to access your home automation system, use encryption on your network, and not using default ports, passwords, or security settings. Many reviewers are unhappy with their smart plugs not because of the plug itself, but because of issues setting up their Wi-Fi network and Wi-Fi signal issues. Your smart plug is only as good as your network, so being attentive ahead of time will save you a lot of headaches and trouble on the back end. The sleek design and affordable price of these Etekcity mini outlets is certainly appealing. They feature easy setup with the VeSync app, and offer timing and scheduling features, Wi-Fi connectivity, and allow you to track and report energy usage on connected devices. The Etekcity plugs are also compatible with Amazon Alexa and Google Assistant for a comprehensive smart home system. The VeSync app is available for iOS and Android devices. 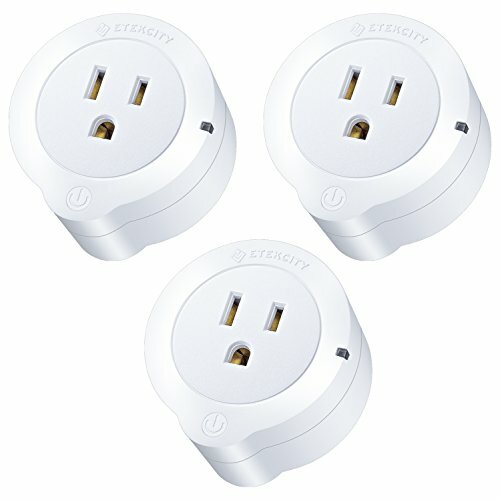 These smart plugs are not compatible with SmartThings, Homekit, or IFTTT. Despite the attractive size and price, people report some difficulties with the Etekcity smart plugs. They will only work on a 2.4 GHz Wi-Fi network, so people often have to adjust their home Wi-Fi setup accordingly. Reviewers using the smart plugs with the VeSync app alone report that the scheduling feature is inconsistent, and different plugs on the same system may act as though they are in different time zones, and that the app may frequently “lose” devices and have to be re-added. Users who have connected the plugs to Alexa and seek to control them that way report that Alexa may consistently show errors even if the system is working, or that Alexa and the VeSync apps show the devices in different states at the same time, making it difficult to remotely tell what is on or off. Connecting with Google Home is more difficult and there is little support from Etekcity for the process. While many people are happy with the system, a large percentage report errors or problematic inconsistencies, particularly when using them along with Alexa. The LinkStyle smart plug system is compact, stylish, and affordable. The small size means that they don't block access to other outlets and fit neatly within a power strip or standard wall outlet. The plugs feature the ability to set timing and scheduling for your devices or randomize lighting so that it looks like someone is home. The plugs can be remotely controlled using the Tuya Smart App on iOS or Android devices and are compatible with Amazon Alexa. These plugs are not compatible with Google Home or IFTTT. SUPPORT AMAZON ALEXA VOICE CONTROL : Control your home with the power of your voice. Use simple voice command to turn On/Off your lights and appliances. Reviewers really enjoy the fast and easy setup of these smart plugs, as reflected in high ratings for both the LinkStyle plugs and the Tuya Smart App. They require a 2.4 GHz home Wi-Fi network, but once connected, they tend to work easily, reliably, and consistently either through the app or with Alexa. A few people report that they aren't very durable and stop working after a few days or weeks, but they are in the minority. To avoid issues, check to make sure that your outlets and appliances are below the maximum 10 AMP rating. While the LinkStyle smart plugs may not boast all the features of some other plugs, they are an excellent choice for Alexa due to their stability and reliability. TP-Link is the premiere name in smart plugs, and this two-pack is a great entry into their smart home system. Like other smart plugs, they require a 2.4 GHz Wi-Fi network, and are compatible with Amazon Alexa and Google Assistant. These plugs support devices up to 15 AMPs. The Kasa app works with iOS and Android devices, allowing users to set devices to run on a timer or remotely control them from anywhere. These plugs also feature an “away mode” that will turn lights on and off to make it seem as though someone is home, for added security. Most reviewers love the stability and consistency of this system but wish for more finesse in scheduling options and tracking features. Some people report that the plugs drop Wi-Fi connection randomly, but they are in the minority. The biggest drawback of these TP-Link plugs is their large size. he bigger profile means that they may block access to nearby outlets and take up more room than other smart plugs on the marketplace. But the ease of use and setup, and the simple, reliable compatibility with Alexa, and the security of the TP-Link brand name make these a great entry into a smart home ecosphere. 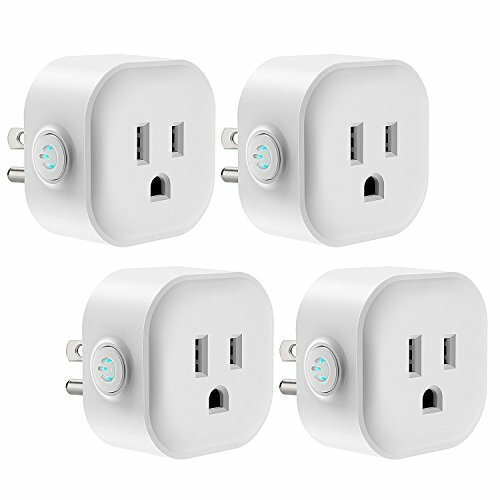 These are also the only smart plugs on this list that support 15 AMP devices, for use with more powerful appliances. 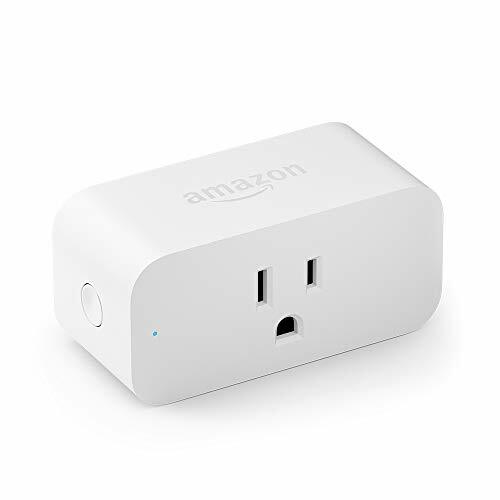 The Amazon own brand smart plugs are compact and also compatible with all the usual suspects like Google Assistant and IFTTT, not just Alexa. In a few years we reckon all homes will end up with these being built in! The app allows for easy scheduling of devices, or remotely turning devices on and off, as long as the outlet is paired with your Alexa app, you can control it without an Echo nearby and even from the beach when you're on vacation! The plug itself only works on the 2.4 GHz wifi band, while Alexa does work on 5G WiFi, the outlet does not. Something likely to get addressed in future iterations of the device. The app is compatible with iOS and Android devices. As you can imagine, it works best in the Amazon Alexa home ecosystem. With so many different brands offering smart plugs with Alexa integration, it could be hard to justify filling your home with them at such a high cost comparative to other brands that do the same exact thing. HOWEVER this is backed and owned by Amazon themselves, so if you can afford to fill your existing in-wall outlets with these, just do it. Simple, convenient and reliable, what's not to like! These Tonbux smart plugs look identical to the PECHAM product and uses the same Smart Life app, as well as having the same features and marketing language. These smart plugs are compatible with devices up to 10 AMPs and can work with either a 2.4 GHz or 5 GHz home Wi-Fi network, making them the only dual-band smart plug on this list. They are compatible with Amazon Alexa and with Google Home Assistant. They are not compatible with SmartThings, Homekit, or Wink hubs. The Smart Life app is compatible with both iOS and Android devices. These smart plugs feature automatic scheduling, remote operation of devices, or a countdown timer to keep devices running for only set periods of time. They are made from a fire-resistant shell to protect your devices and your home. The eerie similarity to the PECHAM product is cause for concern here, and the reviews are only slightly more reliable. Negative reviewers typically report that the plugs work when controlled with the Smart Life app, but not when connected to Alexa or the Google Home assistant. 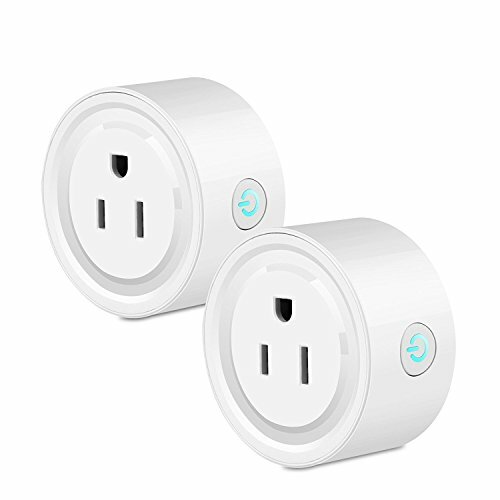 These plugs might be a good choice for simple control via Wi-Fi with the Smart Life app, but probably aren't a good choice for use with an AI assistant system. The Maxcio mini has a compact, attractive design, at a great price for a 4-pack of smart plugs. They work on a 2.4 GHz home Wi-Fi network, and are compatible with Amazon Alexa, Google Home Assistant, and IFTTT enabled. These plugs are also controlled through the Smart Life app, available for iOS and Android devices. With these plugs, you can schedule devices, remotely turn them on or off, or use a countdown timer to have devices operate for a set period of time. The small size means that they won't block other nearby outlets. Family sharing on the app means that all family members have access to the devices, and they have automatic shutdown as a safety feature should usage exceed 10 AMPs. 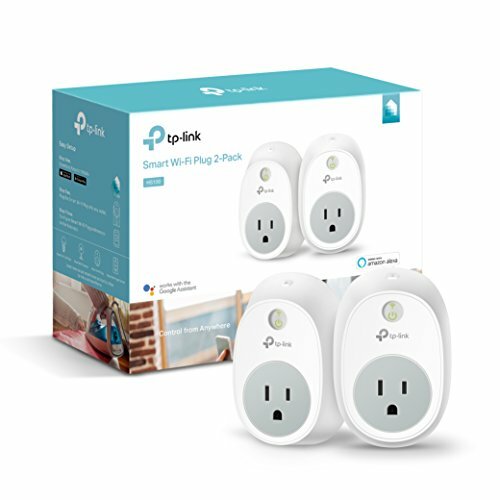 Reviews are generally positive, both when using these plugs with the Smart Life app or when used along with Amazon Alexa or with Google Home Assistant. A few reviewers report a failure to connect with a network, or that they fail after a short time, but they are in the minority. Many reviewers claim to be unable to find contact information for tech support, but that information is in the Amazon listing itself, making negative reviews slightly less credible. Overall, these plugs have a good size, desirable features, and solid compatibility. of the rest - mini plugs and more! 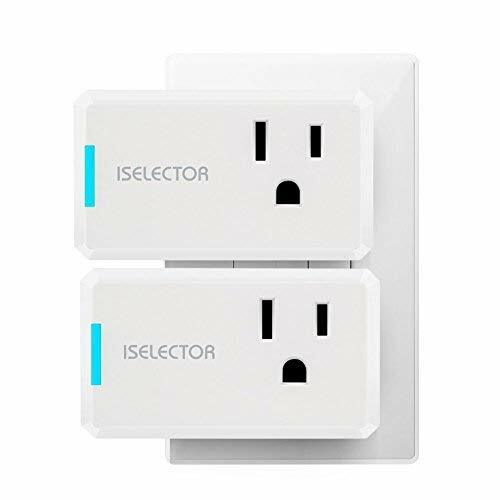 The ISelector mini is specifically designed to not block nearby outlets when plugged in to a wall but may be awkward when used in a power strip. 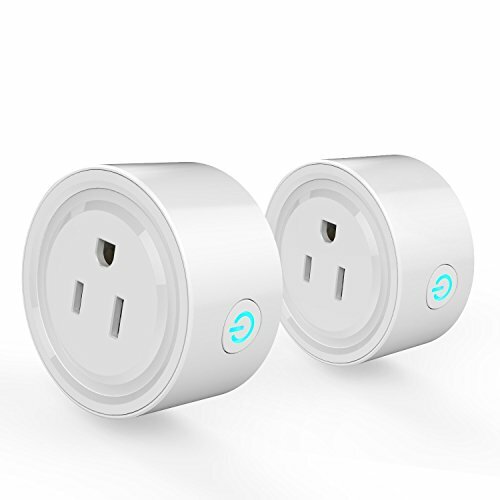 These smart plugs are operated by the Jinvoo Smart app, available for iOS and Android devices. These plugs are compatible with Amazon Alexa and Google Home Assistant. They featured scheduling and timing for devices, remote operation of devices, and have an “away mode” that will turn lights on and off at random. While the manufacturer claims that these plugs work with Google Home assistant, reviewers report that they do not, and that Google support confirms that they are incompatible. Although Amazon star ratings for the plugs are high, only 62% of the reviewers are reliable sources. Reviews on the app and on the associated Amazon skill are very low. Many reviewers are concerned about the extensive permissions required by the app and feel it to be invasive. And some people report that the app causes performance issues with their phone, which is an additional drawback. Given the concern about phone performance, device compatibility and stability, and the claim of features the device doesn't have, these ISelector plugs could be better but they do what they are intended to do. The CrazyLynX smart plug is compatible with Amazon Alexa and Google Home Assistant. Like the ISelector, it uses the Jinvoo Smart app to control the plug, which is available on both iOS and Android, and the Jinvoo app should be used when configured with Amazon Alexa. However, the Smart Life app is recommended for use with Google Home Assistant. Compatible with 2.4 GHz Wi-Fi networks, this smart plug has timing and remote control features. This plug also features a 12 month warranty, and CrazyLynX commits to replying to support requests within 24 hours. It is specifically designed to only use one outlet, leaving the other free, but the unusual shape may work better in wall sockets than power strips. This is another product with suspect reviews that do not pass Fakespot analysis. Unhappy reviewers claim that the plugs do not work with Alexa or Google Home Assistant because they cannot be discovered, or that the plug abruptly stops working after a few hours. As above, people are concerned about the poorly-rated Jinvoo smart app and its invasive permission requirements. The GoSound smart plug has a small shape and low profile. It is compatible with Amazon Alexa, Google Home Assistant, and IFTTT. It requires a 2.4 GHz Wi-Fi network and operates devices up to 10 AMPs. It is managed with the Smart Life app, available for both iOS and Android devices. 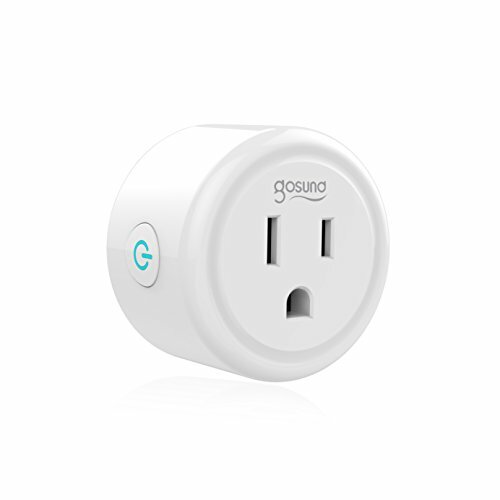 The GoSound smart plug enables scheduling of the operation of devices, as well as remote control of connected devices using the app or with Alexa or Google Home Assistant. It has a 90 day money-back guarantee and a 12-month limited warranty. 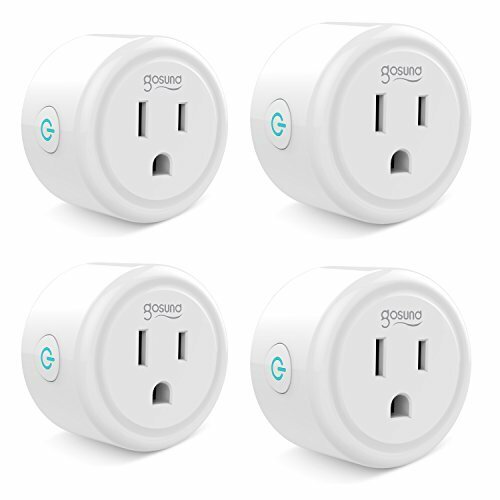 About 30% of the reviews on this product are unreliable, and negative reviewers report that the plugs are inconsistent, with repeated connection losses and sudden loss of function. However, getting hold of support and GoSound honoring the warranty is positive, so it may be worth the risk. 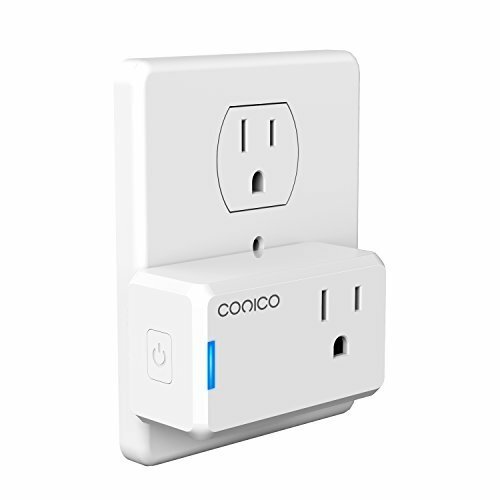 The Conico mini smart plug is compatible with Amazon Alexa and operates on a 2.4 GHz Wi-Fi network. It accommodates 10 AMPs maximum and can also be controlled via the Jinvoo Smart app, available for iOS and Android. It features scheduling and timing of operation, remote control of devices, and a countdown timer to have devices only operate for a set period of time. It has a one year warranty. Although not mentioned in the instructions, this device is also compatible with Google Home Assistant. As previously mentioned, the Jinvoo app is questionable and is a severe drawback to using devices that require it. There have been reports of typical consistency issues with repeated dropping off the network, or Alexa being unable to detect the device. Some people use the Smart Life app instead, which appears to work for the Conico smart plug and resolves some of the concerns with the Jinvoo app. If this smart plug can be operated without the questionable Jinvoo app, then the plug itself is probably functional and reliable. The Potensic smart plug operates on a 2.4 GHz Wi-Fi network, and is controlled by the Tuya app, available for iOS and Android. It is fully compatible with Amazon Alexa, and, if other reviewers are correct, compatible with Google Home/Assistant when operated instead through the Smart Life app. With the Potensic smart plugs, you can schedule devices to operate at certain times, or remotely control them to turn on or off. These smart plugs have not only been widely accepted by people, but they are considered one of the best on the market, making this a great choice for a smart plug. Some people report that the smart plugs stop working after a short time, but Potensic offers a 3-month warranty and service has been responsive. 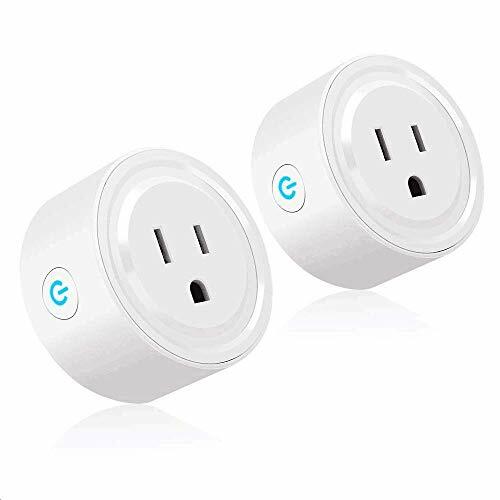 The compact size and high quality of these smart plugs make them an excellent choice for operation through the Tuya app with Amazon Alexa, or the Smart Life app for Google Home services. can I use a smart plug with a power strip? can i use a smart plug with my TV and turn it back on with Alexa/Siri/Google Assistant? how many app-enabled devices can control a smart plug? can I manually operate a smart plug? Yes, you can plug a smart plug into a power strip. You can also plug a power strip into a smart plug and control all the devices plugged into the strip with a single setting. However, the total draw and wattage of devices plugged into the power strip should not exceed the rating of the smart plug. Most TVs do not turn all the way off when you power them down; they go into standby mode. A smart plug will turn them off completely, which can be useful for saving unneeded power. However, once power is restored with a smart plug, most TVs will also need to be manually turned on again before your digital home assistant can control them. If you live in a multifamily household and everyone has multiple devices, this can become a limitation. The exact number of devices that can be configured to control a smart plug varies from manufacturer to manufacturer. If you are concerned about this particular issue, it is good to ask product support before you purchase. Yes, smart plugs also have an on/off button on the plug itself that can be used to turn the plug and connected devices on or off. These buttons are also sometimes necessary for restarting or power cycling the smart plug if there are issues. The number of smart plugs available keeps growing, and these devices are continually improving in functionality and reliability. Because all these smart plugs are in a very similar price range, it's worth it to choose the best brand and support available and try a smart plug or two for simple convenience. Over time, if you choose to expand the scope of your home automation, or change your system entirely, your initial investment in a couple smart plugs won't be a great loss. Smart plugs are a simple and inexpensive way to give you convenience and control of your home environment. They can add safety and security, giving you peace of mind when you are away, and increase your comfort and save time and energy when you are at home. With all these advantages, there's no reason to not explore these technologies today and see where they will lead you in the future.